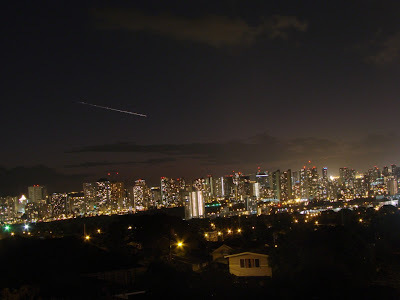 Here is a picture of Waikiki at nite taken from Pu’u o Kaimuki Park during Bob’s Moonwalk in September. In the background could be a nice shooting star or then again it could just be an airplane passing by or maybe we could use our imagination and call it a comet. Here is an orange hibiscus flower at the Luana Hills Golf Course. It is one of the many variety of hibiscus flowers in Hawaii. 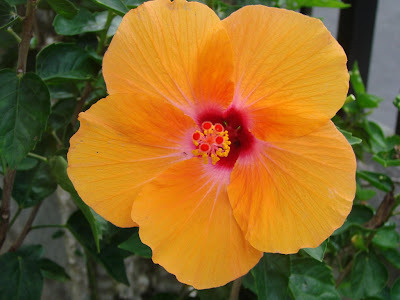 Most commonly associated with Hawaii is the red hibiscus flower though it is the yellow hibiscus flower that is native to Hawaii that is the official state flower. 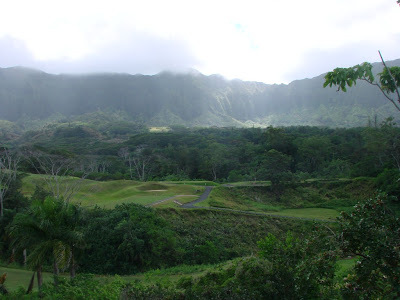 Here is a picture of the Luana Hills Golf Course on the windward side of Oahu. I took this from the clubhouse as I was attending a wedding (Congrats Alicia + Tom awesome wedding). Located in Maunawili Valley you can golf while experiencing Oahu’s native birds, flora and streams. This golf course is also a frequent spot for celebrities including former golfing President Bill Clinton and President Barak Obama.